From February 23-25 the best in innovative embedded technology will be unleashed at Embedded World 2016 in Nuremberg, Germany. This not-to-be-missed event will attract over 900 exhibitors from 42 countries. Crank Software will be there, and we are bringing a team of passionate embedded GUI design professionals with us to showcase the latest features and capabilities in Crank Storyboard Suite, our design and development platform for building stunning GUIs for embedded systems. 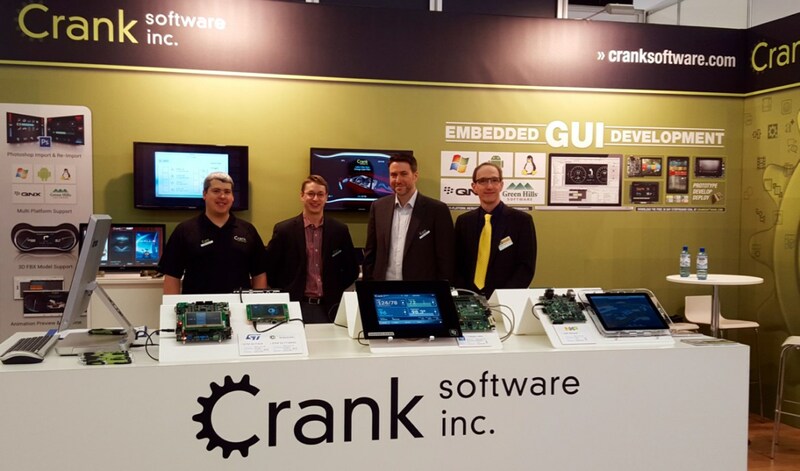 If you are among the 25,000 visitors expected at Embedded World 2016, stop by Hall 4/4-547 to check out our latest embedded GUI demos and ask us to show you what's new in Storyboard Suite for graphic artists, 3D designers, and embedded systems developers. Our embedded GUI demos this year cover a wide range of markets, including automotive, home automation, white goods, medical, and kiosk solutions. All demos have been designed and developed in Storyboard Suite, using the latest features from our upcoming 4.2 release. While you’re making the rounds at the exhibit, check out some of our partners showcasing beautiful demos built with Storyboard Suite technology, including Green Hills Software (Hall 4/4-325), Atmel (Hall 4A/4A-238), NXP (Hall 4A/4A-220), and others. We will be live-blogging from the event, and sharing photos and videos of Storyboard Suite from the exhibition floor. Our Storyboard Suite 4.2 release is right around the corner, and we are excited to show off the features and capabilities we've added for embedded GUI design teams. Stop by the booth ask to see live demos. If you want to get together with us at embedded world, please contact us to set up a meeting. Alternatively, come by our booth and chat with us. The Crank team are stereotypical friendly Canadians! To learn more about what to expect in the Storyboard Suite 4.2 release, check out our recent webinar, now available on-demand. As always, we provide a full-featured 30-day evaluation for you to try out Storyboard Suite first hand.